It only took FIVE YEARS, but I finally have my sound clips page up! I tried to include a variety of stuff, indicative of the types of gigs that I play regularly. Please check it out and email me some feedback on it. I'm still working on getting some classical stuff up there. . . In other news, I've finally started working on a solo CD project. I'm shooting to start recording next summer, and I'm considering starting a blog to post my journey to a finished CD. It's been a very long time coming, but I'm excited about this project. I'd love to hear some feedback, so email me! I'm busier than ever with playing, writing, practicing, and teaching, but you can always check on the site to see what I'm up to. Check out the link at the top of my SCHEDULE page to go to my GOOGLE calendar to see where I'm going to be. And don't hesitate to come up and say 'hello' if you make it to one of my gigs! SHOUT-OUT to my buddy, drummer Paul Wells! He just played on the Today Show with vocalist Debbie Harry (of BLONDIE). Look for her (and Paul) in a city near YOU! LOTS going on. . . .but what else is new? Please swing by my SCHEDULE page to check out some of the new projects I have going on. Foremost among them, the return of the original BEAM. This will be our first gig together in almost 3 years and I'm excited to play with the best band in the world again! Also drop over to rickgallagher.com and check out clips from his beautiful new Christmas CD - Snowriding (also featuring Tom Wendt and George Jones). Rick has done it again, making a really awesome CD from top to bottom. It was a pleasure playing his great holiday music. You need a copy or 2 under YOUR tree! Happy Holidays!! LOTS happening since the last update! 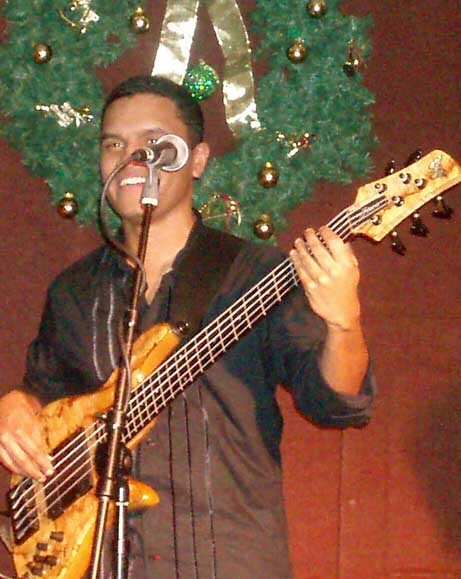 Firstly, bassist, luthier, and my friend Willy Franklin was involved in a serious motorcylce accident a couple of months ago. He is rehabbing with the help of his great family. Let's all hope for a speedy recovery for him and that he's back up on his feet and playing again SOON. You can drop him a line and read his recovery blog at www.willyfranklin.com. In other news, I've been involved in the recording of 4 CDs. First is my second CD with Billy Price called East End Avenue--now available! This collection of songs was recorded at Bonedog Studios in McKeesport. For the first time, Billy's original material is featured throughout the album. It was a ton fun to record--and most of the songs were first takes! You can buy and hear samples from the CD at www.billyprice.com. Also, check my schedule for lots of dates with Billy Price this summer. The other 3 CDs are "in the can" and yet to be released. They are a new CD by SALSAMBA (with new member Tom Wendt on drums!) and 2 new CDs with pianist Rick Gallagher (including a new Christmas CD). Lastly, I want give a shout out to Mike Shank--master luthier and doublebass repairman. I had a chance to stop by his shop with my instrument on my way to a gig in Reading, Pa. He was not only helpful, but a great guy. I would reccommend his services, regardless of travel time! Thanks, Mike! Busy summer. . . . . please check my schedule, and I hope to see you at a gig! Peace. The MS Walk is almost here!! Sunday, April 23rd at 9am join me and hundreds of others and walk to raise money and awareness about Multiple Sclerosis. You can walk one, five, or ten miles (guess what I'm doing), or you can sponsor ME and pledge your support (and live vicariously through my tired body!). Click here for my own personal walk page and for more information. You can also visit the National MS Society. I guess it's about time that I updated. Lots going on! Still busy with teaching at CAPA High School, keeping my hands full, but playing in alot of projects. If you check my schedule, you'll notice a few dates with the CAPA Sax Ensemble and the CAPA Jazz Orchestra. I direct both of these groups and our repetoire is actually mostly stuff that I've written or arranged. Come to one of our concerts--the students are amazing! I just had the pleasure of recording Billy Price's latest CD--East End Avenue--my second time in the studio with him. You can visit his site for some pictures. It was an incredible experience and Billy is truly one of the greats. Check back for release info and dates. I also had fun going back into the studio with Mike Tomaro and the Three Rivers Jazz Orchestra to record our 2nd CD in 2 years. It was some of the most challenging stuff I've played, but the musicians were great (so was the food), and we had a great time. Stay posted for release information. Lastly, I want to give ANOTHER shout out to luthier extraordinare Willy Franklin and let all you gear-heads out there know that he's started work on PT Bass #2. That's right. We've "tweaked' a few things from the first bass (body shape, pickups, wood) and this one should be ridiculous! Stay posted. Like the once-trendy Lance Armstrong yellow cancer bracelets, the MS Society has launched thier own bracelet, as well. The red bracelet is called the MS Band of Hope, and is adorned with only the word HOPE on it. Buying the bracelet will not increase your fashion sense, but will help to increase awareness of Multiple Sclerosis, as well as your small donation (about $1/bracelet) to help fund the fight against the disease. Please visit www.nationalmssociety.org for more information, or email me. I bought a BUNCH. Let's make sure everyone knows about MS so that we can find a cure. Much thanks to Ilona Knopfler and Jay Ashby for bringing me aboard to make some gigs with her this summer! I had a BLAST at the Syracuse Jazz Festival this week, and I'm looking forward to playing more with her coming up. Much thanks to Willy Franklin, as well. I finally saw and held the PT 6-String Bass for the first time after exchanging many emails with Willy over the past few months. The bass looks even better than I could have imagined. . . really! I can't wait to play it in a couple of weeks. Please visit the PICS page to see some NEW pictures and come back soon for even more. I'm happy to say that after owning basses by: Sears, Yamaha, Ibanez, Fender, Modulus, Sadowsky, Warwick, and Fodera (yeah, I got rid of it), it looks like I might have finally found what I was looking for! Willy Franklin is building me the bass I've always wanted, from body shape, to woods, to electronics. The neck-through instrument will be a 6-string with ash body-wings and a 3-piece maple neck. It'll have a single Bartolini Quad-Coil pickup and a single cutaway. It's exciting seeing it come to life, and I'll keep you posted along the way. You can see actual pictures of the neck, body, and fingerboard as they take shape here. Please visit Willy Franklin Guitars and sample some of his beautiful work. While you're at it, visit the Blues Cafe on the South Side on a Thursday night and sample some of his WICKED bass playing! I'm very sad in mentioning the passing of 2 GREAT bass players here in Pittsburgh, as well as 2 of my friends. Herb Marshall was honestly one of my favorite electric bassists, and he always greeted me with humility and kindness. He played around town with just about everyone including The Bottom Line, Donna Davis, and Tony Campbell, among MANY others. He played like no one has or ever will, and he did it with infinite class. Mike Taylor was a mainstay on the Pittsburgh scene for years. Not only did he tour and play with pianist Ahmad Jamal, but he had a doctorate in ethnomusicology as well. He was one of the most gentle people I've ever met, and he always greeted me with a smile, ready to hand me his bass to sit in. He had a huge sound on the double bass, and he knew how to push the music in the right direction with just a note. Both of them will be missed. . . . . I forgot to mention another project that was VERY pleased to be a part of: pianist Max Leake's latest CD Trios. You can visit this link to CD Baby for more information and streaming audio. For those of you with any interest in Music History, or those of you that are CAPA students that miss one of my classes during the week, I'm now posting class lesson information here on my website. Take notes fast, this page will change VERY frequently. I guess it's time to update my webpage again! Needless to say, I've been busier than ever with new projects in my life. First of which, is my departure from Rogers CAPA Middle School to take a position teaching at CAPA High School--my alma mater. I'd like to thank all of the students and staff that helped make my tenure at Rogers a great one, especially Ms. Laitta! I'm excited to be back at CAPA everyday working alongside some of the teachers that taught me so many years ago! Stay posted for news about teaching and about some of my talented students. I'm still also involved in several incredible musical projects, and have had the fortune of being able to be a part of some great recordings over the past several months. These include my friend Tom Rocco's debut release Matters Of The Heart, my good friend trumpeter Jamie Moore's CD, and an incredible big band CD with Mike Tomaro and The 3 Rivers Jazz Orchestra--The NightOwl Suite. I'm also playing just about ALL new gear, including an incredible new acoustic bass from the String Emporium. I'll get around to that page eventually. . .
Last, but certainly not least, I'm excited about one of my current gigs: music directing GHETTO SUPERSTAR--the incredible one-man show written and performed by the amazing Billy Porter. The show is awesome. Catch it at the City Theatre before it closes May 1! So much change going on in my life--and yet so little time to update my webpage! Here goes. For those of you that don't know, I was recently diagnosed with MS or Multiple Sclerosis. MS is an auto-immune disease that can affect each person in a different way. For me, I went through a period of dizziness, numbness in my right hand, and fatigue. About 400,000 people in this country live with MS, and while it's not a fatal disease, it can be pretty devastating for some that live with it. I guess you could say that I'm fortunate. My symptoms were comparatively minor and, with help from my neurologist, I was able to be diagnosed very early in the disease's progression. I'm now on MS medication and I'm living as healthy a lifestyle as I ever have. I also feel great--and I intend to stay that way. Being diagnosed has been a scary experience for me. My own misconceptions about the disease along with my fears of living with MS and talking to my friends and family about the disease seemed overwhelming. After beginning treatment and talking to my doctor, I realized that MS is not only something I can manage, but something, in many aspects, I can overcome. To learn more about MS visit www.nationalmssociety.org.